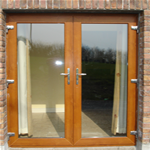 We offer an outstanding variety of designs and styles for all your external doors using top quality materials and accessories. 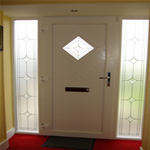 Combining style and function, our selection of residential doors come in a multitude of colours with glass and panel designs to suit every taste. 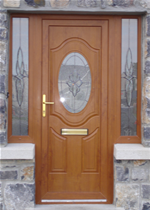 O'Grady uPVC is proud to offer Palladio composite doors in addition to our uPVC range. 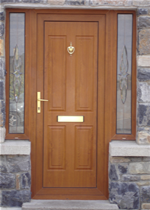 Palladio doors are, in our opinion, the finest composite doors on the market today. The wood grain finish on these doors is superb and its unique monocoque structure gives it a massive strength-to-weight ratio. 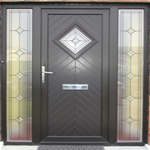 See the Palladio Door Collection brochure here or visit the manufacturer's website here. 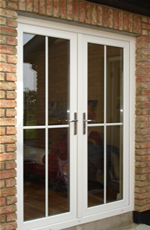 Classic French Doors add a touch of elegance, bringing sunlight and warmth to a room and linking your home and garden. Available in the same wide range of colours as our window units, we can also incorporate Georgian bars or other glass features to coordinate with surrounding windows. 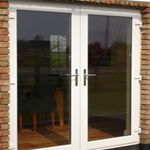 Patio doors can be used to similar effect and are especially beneficial in areas of limited space. 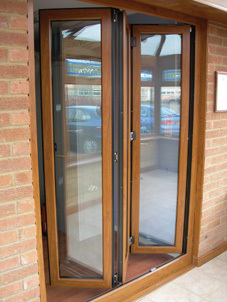 We also offer the increasingly popular bi-folding door. This system allows for a complete wall to be opened up in the summer for a larger space. It is available in a wide selection of configurations. We have recently sourced a new line of door handles and hardware which offers unrivalled choice in both design and colour. 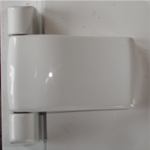 There is sure to be a handle that complements your door. Available in black, white, chrome, satin chrome, gold-effect, bright bronze and satin bronze. Our range of door hinges is new to the market, once again in a classic, simple design which coordinates with our door handles. This versatile look lends itself to both traditional and contemporary homes. 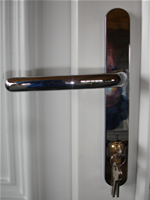 For your home's security and your peace of mind we commissioned a state-of-the-art locking system from our German manufacturers Roto which combines a hook-keep three-point locking system with cam-rollers and a deadbolt. 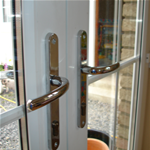 We fit this secure locking system on all our doors. In addition, reinforced frames provide a stronger door unit.